I am a graduated psychologist from the University of Westminster, London. I have always had an interest in dog behaviour and the future of dog psychology which stems from my experience working with children/adults with Autism/Aspergers. I thoroughly enjoy caring for animals and would tend to your furry friend with plenty of treats, walks, and play time with other friendly and good natured dogs like my Toy Poodle, Boris. Should your dog have any special needs you can rest assured that they will be tended to with precision and care, so that you can go about your day without worrying about your loyal companion. I’ve had the pleasure of spending my whole life with dogs, and became very active in dog communities as the years went on. I became a breeder for Poodles and English Cocker Spaniels, who later went on to become champions in many countries across the globe. I opened the first pet grooming salon registered in Yugoslavia in 1994, when I began to build on my experience in professional show grooming and handstripping. I really do believe in the saying that if you choose a job you love, you will never have to work a day in your life. Top Knot” is a place our four-legged family members can visit to get dolled up and treated to a proper grooming, which opened at the beginning of this year in Belgrade, Serbia. The owner and founder, Djordje Andrejic, named the salon after the hairstyle which Poodles, Maltese, and Yorkshire Terriers wear for dog shows. Although this hairstyle is not linked to the Old English Sheepdog, one happy and chubby representative of the breed sporting a groomer’s smock is the logo for this salon, which is the first of its kind registered in the region. Djordje Andrejic gives his four-legged clientele a calming atmosphere in which he can tend to their general grooming needs such as baths, haircuts, and preparation for dog shows. 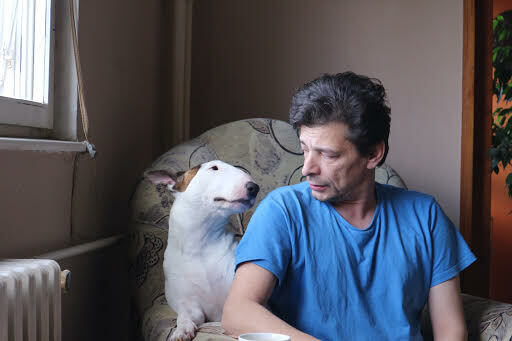 He offers his services to all breeds of dogs, and even has a feline client by the name of Caesar. The salon is equipped with modern equipment up to world standards for grooming, from the grooming table to the various tools used to meet client’s needs. “On the opening day, we had two unexpected guests who had unfortunately been left on the streets; we treated them to a grooming session and they will always be greeted with open arms at our salon for a snack and a nap,” says the owner, who took the strays arrival as a sign of good luck for the shop.